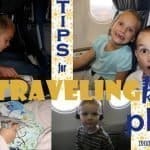 I love to travel, plan, find a good deal, pack, and spend uninterrupted time with my husband and little ones. The Memories? Priceless. Getting to our new destination? It can be a friggin nightmare sometimes. With seven of us in tow, we don’t fly often due to the expenses of it all. Most of the time we road trip. Now when I say road trip I don’t mean: let’s spend days on end in the car together heading from one side of the US to the other while we punch, kick, fight, and whine with each other. Ours is more of a get to our destination as fast as we can type of road trip. By this I mean one day max. 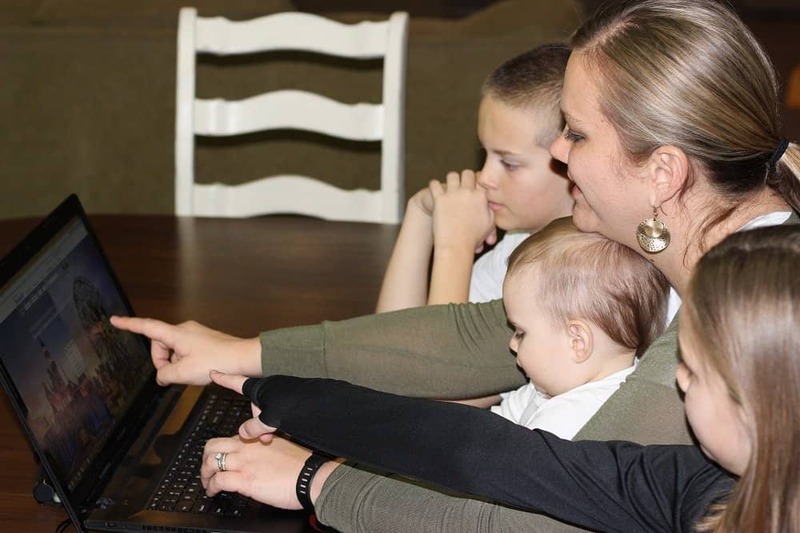 With five kids under 10-years-old, that’s all this mom can handle. Fortunately, we live in an area where there are a lot of options within 12 hours of our home. So we take a trip every six months. Through all the trips we’ve taken, I’ve learned that road trips, even with small kids, can be fun and are great memory making opportunities! As a little girl, my family took quite a few road trips. I remember looking out of the windows and making shapes out of mountains or clouds and taking in the scenery. Sometimes I would take a nap. Sometimes I would get out my tape player and listen to Paula Abdul or Mariah Carey or even my BELOVED 80’s mixtape. Today it seems like kids need to be more entertained than just looking out the window and taking in nature. That’s unfortunate because there’s a lot to learn about each other on these trips. Unfortunately, our first road trip as a little family did not go well. I was not prepared for the constant cries of “I’m bored”, “Are we there yet?”, and “This trip is stupid”. It was NOT fun. We fought the whole way there, and it set an unpleasant tone for the rest of the trip. So, the next time we went, I knew we had to be better prepared. 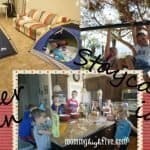 Through that journey and many afterward, here are some ideas that I’ve found work with us when traveling long distances with small kids. 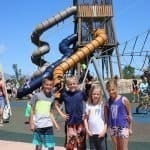 Get the kids and husband involved in the planning process of the trip. Of course it’s easier for me if I just decide where we go and what we do. It gets done faster and how I want it to get done. But this is their trip too. Let them have some say. You can still keep control of the trip and make them feel like they had a part in planning. Come up with 2-3 options of places to go and things to do. Take a vote to decide on where to go. This will make your road trip more exciting to them as they’ll feel like they took part in the final destination. Give each kid their own book. A few years ago I made each kid a binder of fun things for them to do with specific things I knew they’d enjoy. It was easy to do, and there was no fighting over coloring books or crayons. In their binders, I put coloring pages from their favorite movies or TV shows. In some of our kids’ binders, I also put road trip *bingo pages or scavenger hunts. For others, I added a license plate check mark list. I found some ideas here and printed and laminated them. There’s a lot you can put in their binders, but whatever goes in there make it age appropriate and fun. *To mark off the bingo cards or license plate checklist we used these post-it flags instead of dry erase markers. I used some of my own ideas as well as pages from Gluesticksblog.com to make these great binders for each of the kids. Avoid Crayons – They Melt! I used to buy each kid their own coloring book and their own box of crayons for a trip. It was new and exciting and something that they had never done before. Then we went to a warm climate destination and disaster happened! All the crayons ended up on the floor of the car and melted. No good! As an alternative, I started buying Crayola Wonder Coloring Books. The kids love them and markers don’t melt! We give each kid their own bag for the car. I know that packing five little bags of toys sounds annoying, but it’s worked great for us. 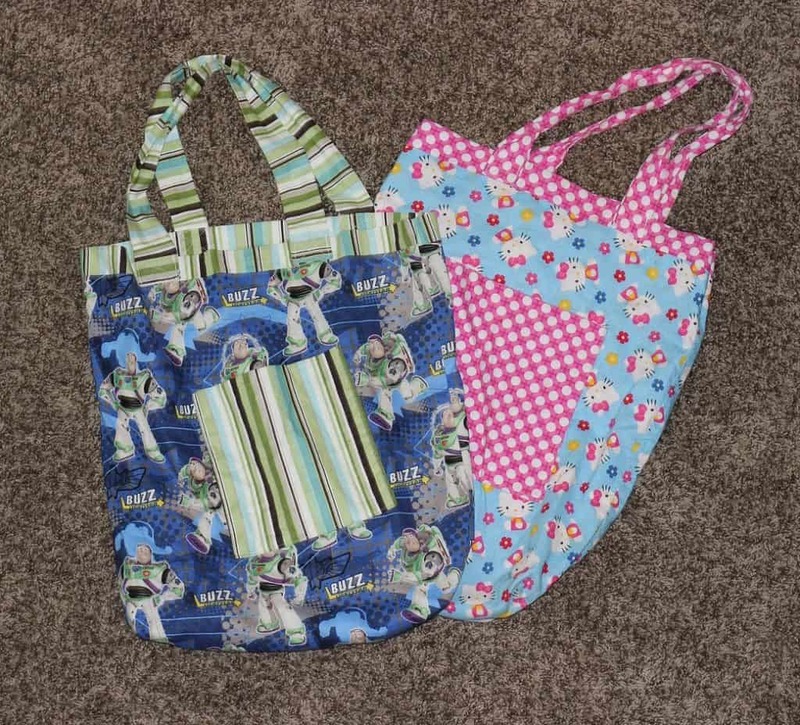 I took the kids to the fabric store, let them pick out their own fabric, and made them each one of these little over the shoulder bags. They have long handles so they can be hung over the seat in front of them. 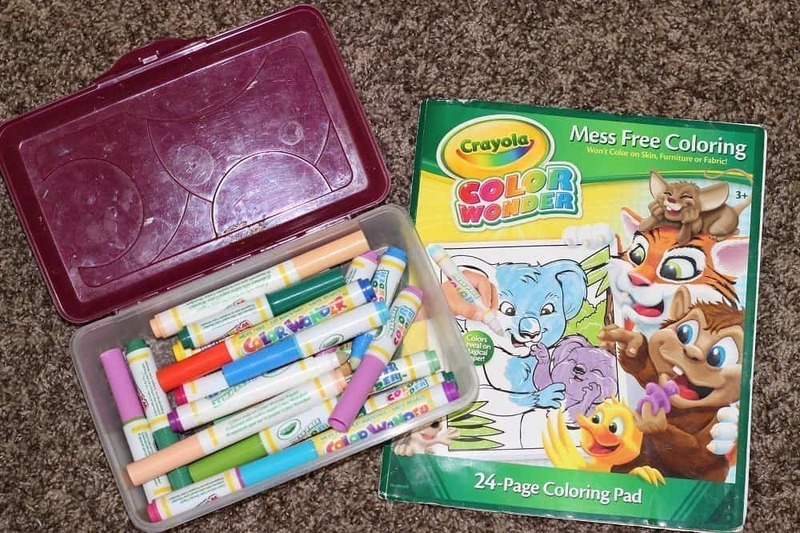 In each bag, I put the kids fun binder that I made, a color wonder book, and then they get to pack the rest. They can take whatever quiet toys fit in their bag. This helps them be responsible for their own special things. There’s nothing worse than crackers smashed into the carpet of your car or drinks being spilled on your seats. For this reason, I like to have complete control over food that is eaten in the car. In my opinion, it’s worth it to spend a little extra money buying snacks that are individually wrapped. For snacks that don’t come in individual wrappings, I give them their own cups from the dollar store. I fill those cups with snacks or treats along the way. They’re happy because they have their own cup, and I’m happy because I can control the portion sizes. I also give each kid a second cheap plastic cup for their garbage. I’m a fan of snacks that won’t make a giant mess if spilled and stepped on. Fruit snacks, goldfish, fruit leathers, licorice, string cheese, apple slices, and carrot sticks all fit into that category. If possible, plan for snacks that don’t make them super thirsty. Remember, the more they drink, the more you stop along the way! I hate the phrase “Are we there yet?” It usually starts about 20 minutes into the trip and makes the ride seem like an eternity. For that reason, I like to make tags for destination spots along the trip. We put them on the sun visors of the car and when we pass that city or location marker, we take a clip off the visor. This way they can see how far we’ve come and how far we still have to go. Sitting in a car for a long time is hard for kids. Reward them for good behavior. I make car bucks. Each time they are good for an extended period of time they earn a buck. Each time they were nice to someone else or didn’t whine they earn a car buck. Car bucks can be used to buy a special treat when we stop to gas up. We made each car buck worth $.25. It really helped with the fighting and whining and made our stops a little more exciting. Car bucks can be used to buy a special treat when we stop to gas up or even a souvenir when we get to our destination. We made each car buck worth $.25 but you can do whatever feels right for your budget. It really helps with the fighting and whining and makes our stops just a little more exciting. Be patient. This is the hardest part of road trips for me. You are all in each other’s space for an extended period of time and can get on each other’s nerves. There may be times when you stop for a bathroom break and 40 miles down the road your toddler has to go again. Give yourself enough time on your road trip to allow for stops like this. If you are pressed for time to get to your destination, you are more likely to be stressed. Don’t stress; be flexible and just roll with it. On longer road trips I like to change up the fun every few hours. So, I go to the dollar store and buy a few things for each kid that I know they will like. You know, stuff you typically find in stocking stuffers. Then, every couple of hours, I give them one of their new toys to open. It’s something new, fun, exciting and provides new entertainment they haven’t seen yet. It’s also super affordable for me! If you’ll be traveling during mealtime, use that time to stop and take a break. It’s tempting to go through the drive-through, grab a meal and keep going, but try to stop and let the littles stretch their legs. Be mindful of your stopping spots. My kids are picky eaters so we only have a few places we can go where all of them will find something they’ll enjoy. That being said, they’ve been sitting in the car and being good, so don’t choose a sit-down restaurant where they’re forced to be still! If you do that, you’re setting yourself up for cranky kids. This leads to cranky travelers when you get back in the car. 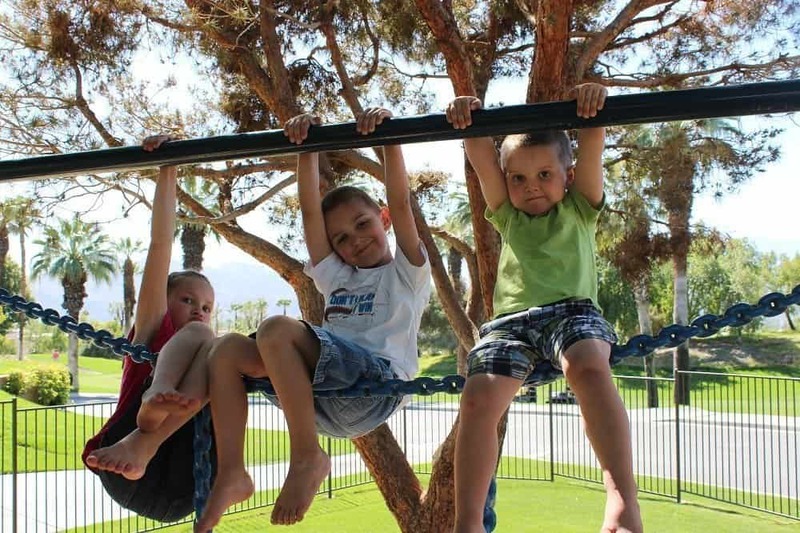 Instead, choose something like Subway at the park or even fast food with a play place. Go somewhere it’s OK if they got a little hyper. Tell a story. Use this time to tell the kids stories from when you were little. Or better yet, make up a story. Have someone start the story with Once Upon A Time. Then the next person gives the next sentence of the story and so on and so forth. It will have the whole car laughing with the silly story you come up with. That’s how memories are made. 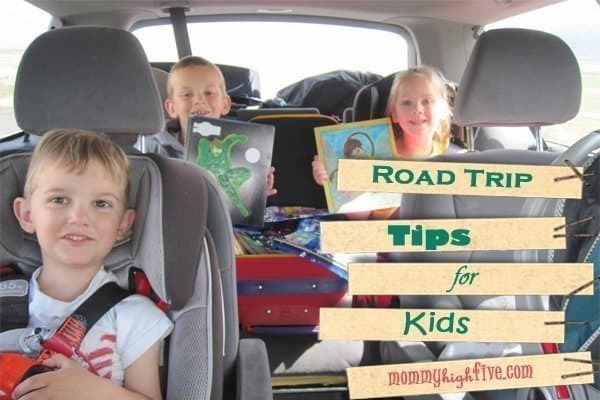 Road trips are a great way to save money when traveling and to grow closer together as a family. It’s so important to have that time together to chat, laugh, get to know each other better, and create memories that they’ll cherish forever. It won’t always be peaches and cream, but you can make it fun! Take a little time before your trip to plan it all out, and you’ll have a great time with happy travelers. Happy travels!